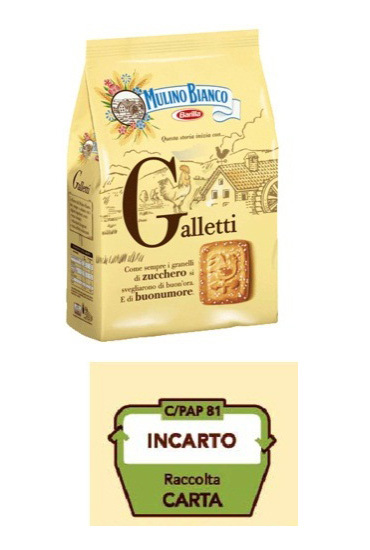 Barilla rendered the packaging used for Mulino Bianco cookies in paper and film composite recyclable through modifying the thickness of the film and the adhesive used for combining the materials. The new packaging passed the Aticelca MC 501-11 test for recyclability and can now be added to paper recyclables when separating waste. Furthermore, the size of the container was reduced by 10 mm. The company adopted and certified an Environmental Management System in compliance with UNI EN ISO 14001 standards and became the first food company to have implemented an EPD process. The reduction in environmental impact is primarily due to the recyclability of the new packaging. During the production stage, the more paper that is used, the more water is consumed; nevertheless, it should also be taken into consideration the fact that thanks to the recyclability obtained through the intervention, the quantity of paper produced and used for the packaging will once again available for the production of recycled paper to be used in subsequent production processes.